← Introducing ZeBot (That’s Me)! 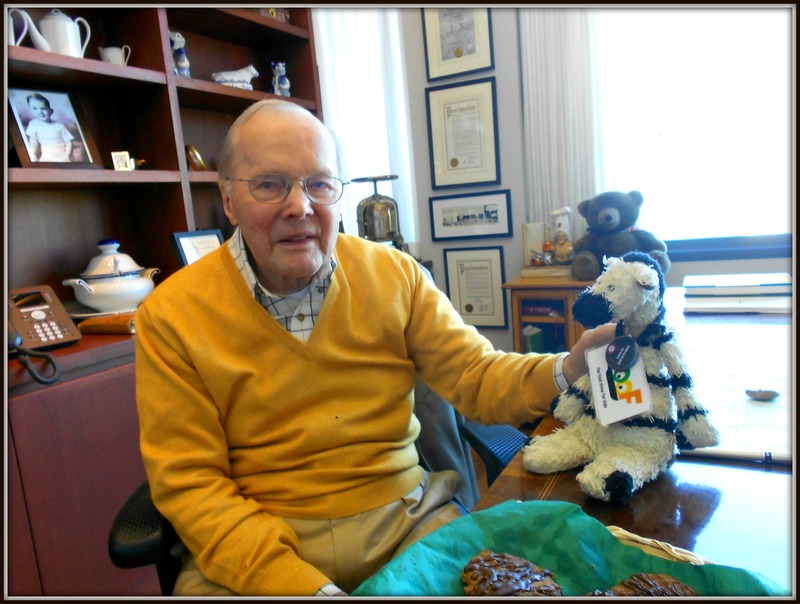 If you’re a kid, you’ve probably heard of baloney (I mean, even zebras know about that stuff). But have you ever heard of abalone? I never did—until I got to visit a super-cool Bay Area aquafarm with some buddies from the San Francisco Professional Food Society. This is the sign on the docks that pointed us toward our adventure. Our adventure starts down on the docks at Half Moon Bay’s historic Pillar Point Harbor, where Google Executive Chef Olivia Wu and California Abalone Company owner Doug Hayes team up to explain the ABCs of abalone (you say it “a-baloney”) – from farm to table. Meet my friends Olivia & Doug! Why does he say that? Well, wild abalone (a kind of shellfish known as mollusks) have become very rare –the Monterey Bay Aquarium calls them a “recovering population”. 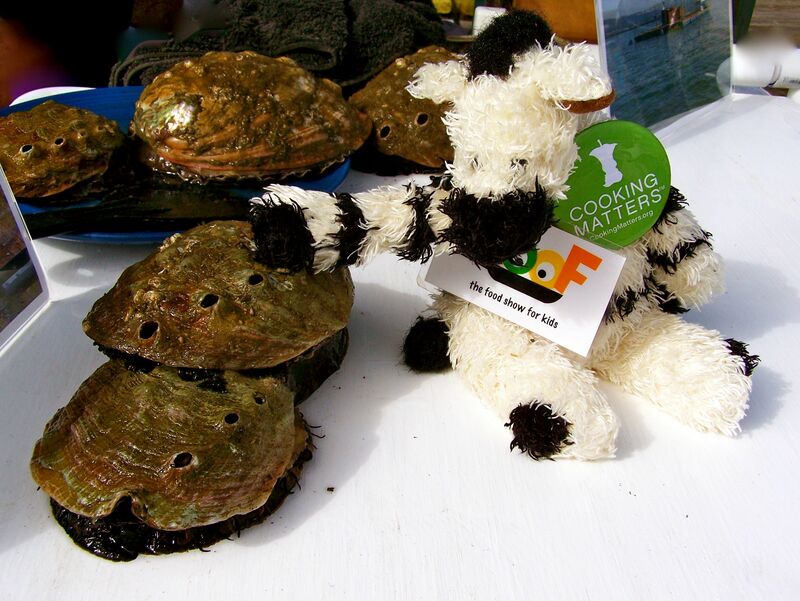 Doug cares a LOT about sustainably farmed abalone – and so do I! That’s why Doug decided to start an aquafarm where he could raise abalone sustainably, so that the wild population can keep on recovering. 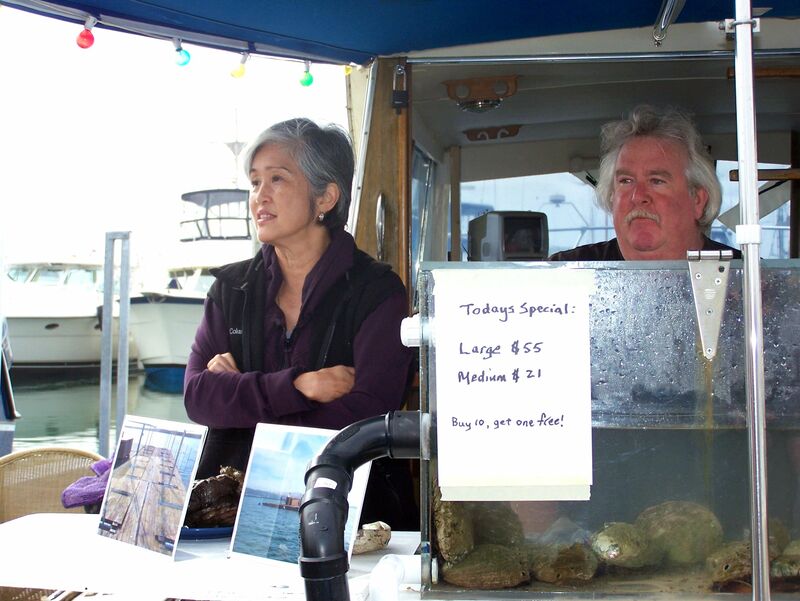 At the farm in Pillar Point Harbor, only the best is good enough for Doug’s abalone. 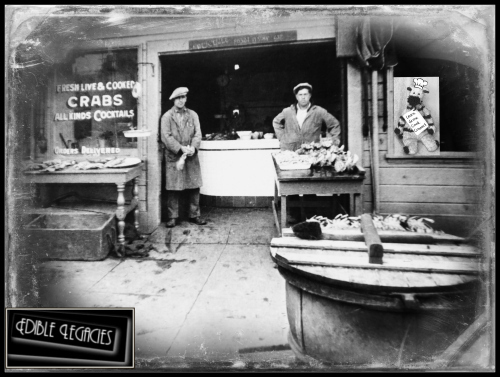 Every Saturday, he drives down to Monterey to harvest a ton of kelp in the three tasty varieties that make up the mollusks’ favorite menu, then hauls the fresh seaweed out to the farm to feed his gang of shellfish. The smallest abalone are about as big as a nickel – and will take up to 14 years to reach the largest size that Doug sells off his boat (the “medium” ones are about nine years old). Introducing: the abalone! Aren’t they cool looking? When you’re buying something as rare and valuable as abalone, you want to make sure to prepare it properly – so Doug and Olivia provide all the details. “In the Asian cooking tradition, abalone is sliced very thinly, stir-fried, poached or steamed,” Olivia tells us. “You want to keep it really simple so you don’t overpower the abalone’s delicate flavor,” Doug adds. 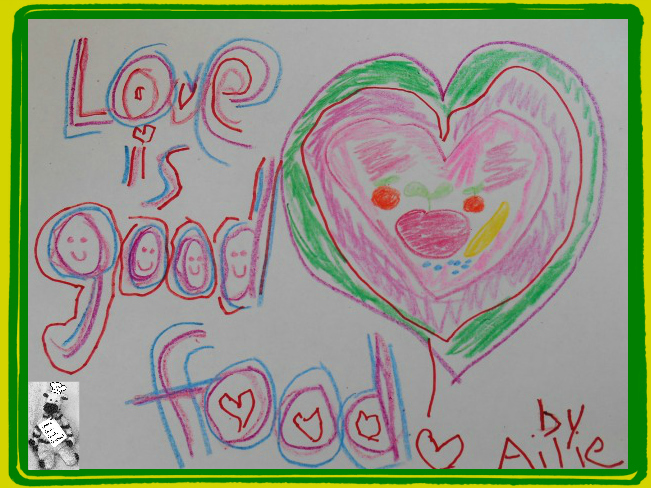 I figure that, when it comes to cooking, simple is always good. I’m still working on the basics, so easy recipes are the ones I go for. Ahoy, sailor! 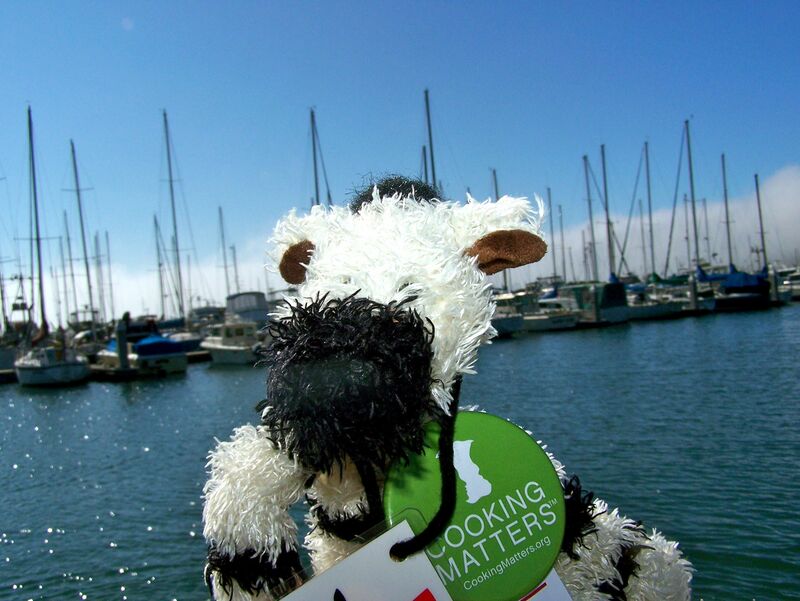 Did you know zebras were such nautical naturals? After we’ve have been clued in on the how-tos, Jim Anderson of the Half Moon Bay Fishermen’s Association makes a surprise announcement: he’s arranged for a vintage 1920s fishing trawler to take us out to the underwater farm for a close-up look. 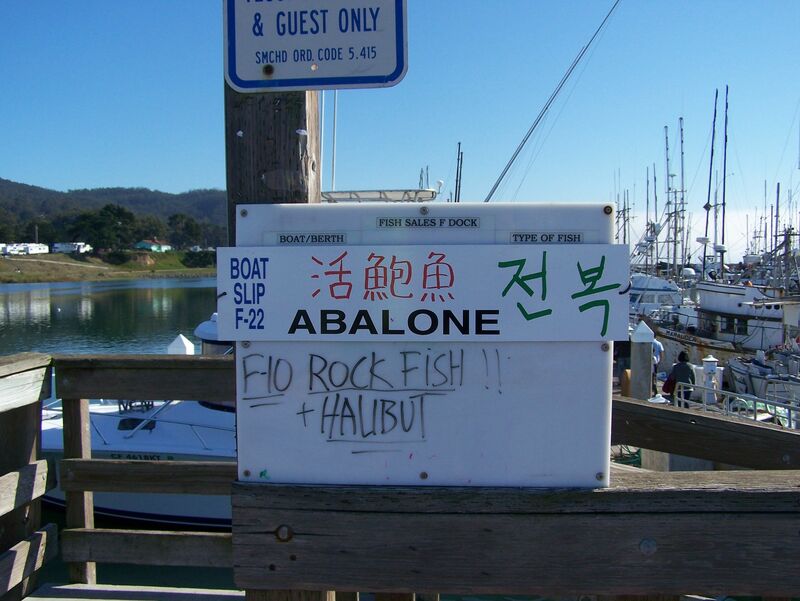 The aquafarm is just inside the harbor breakwater, where water conditions are perfect for abalone. 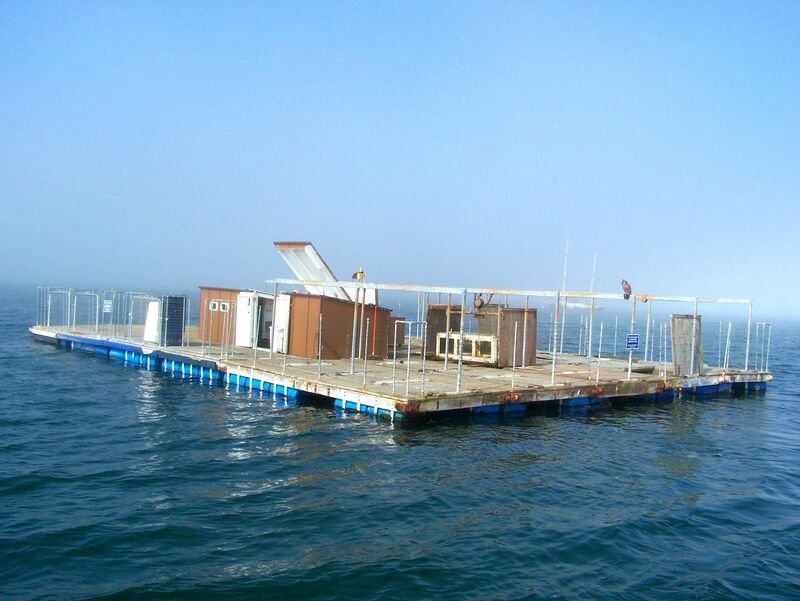 We cruise by the 3000 square foot platform that marks the top of the farm – and use our imaginations to envision the cages deep underneath the water. Each cage is as big as a car – and home to hundreds of happy abalone. You can just see the top of the abalone farm here — the car-sized cages are underwater. Another cool thing we learn about while we’re on the boat: besides being good to eat (and good for you because they’re high in protein and low in fat), abalone have beautiful shells. On the way back to the dock, our new friend Tom (who also owns an abalone company) shows us some of the amazing examples of magical, multicolored shells – check them out in the photos below. Abalone shells are some of nature’s amazing works of art! 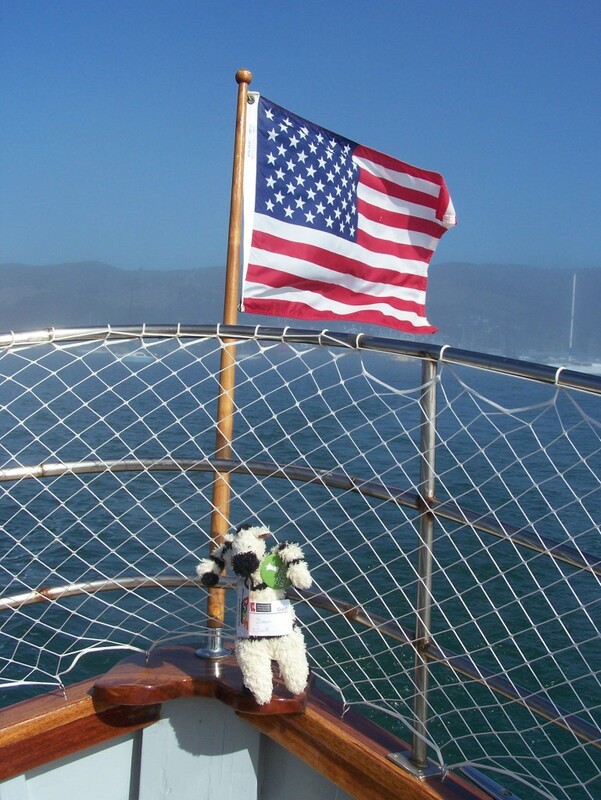 When we get back from our voyage, we head over to the nearby Maverick’s Event Center for more briny seaside fun. 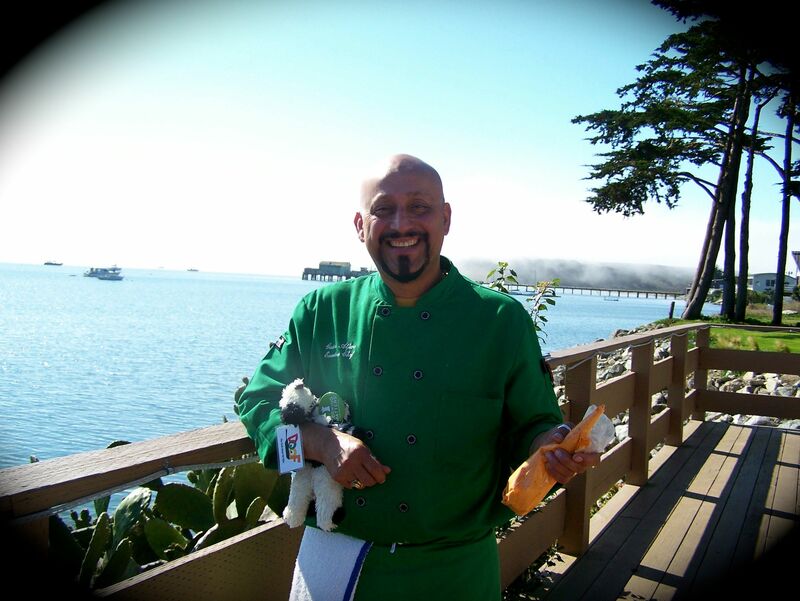 Gaston Alfaro, Executive Chef at the Half Moon Bay Brewing Company, shares his secrets for prepping, cooking and serving abalone meuniere. Chef Gaston dips the abalone in a little flour and egg, then fries it quickly in butter. I learned lots of great kitchen tricks from my buddy Chef Gaston. I’m trying to learn everything I can about human food, so I’m anxious to sample a tender, golden piece of Chef Gaston’s abalone. 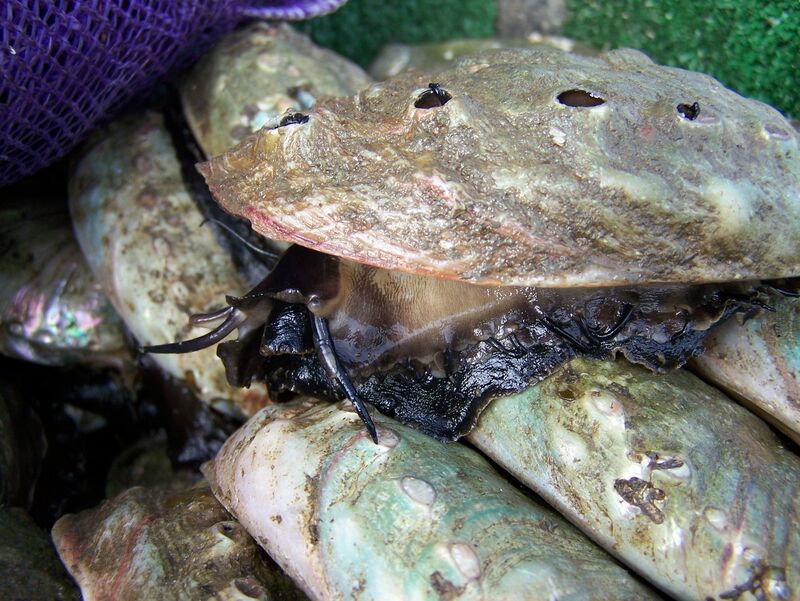 What does abalone taste like? Well, not at all like baloney, but it’s really good. To me, the shellfish tastes very light and delicate, with a rich, buttery goodness that blends beautifully with faraway flavors of the sea. Here’s Chef Gaston’s abalone meuniere — doesn’t it look yummy? 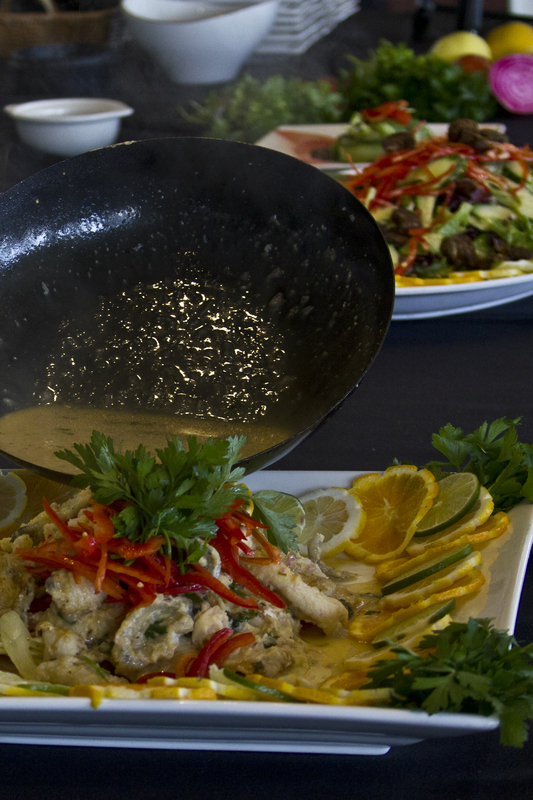 So does this make you hungry for your own home-cooked abalone? 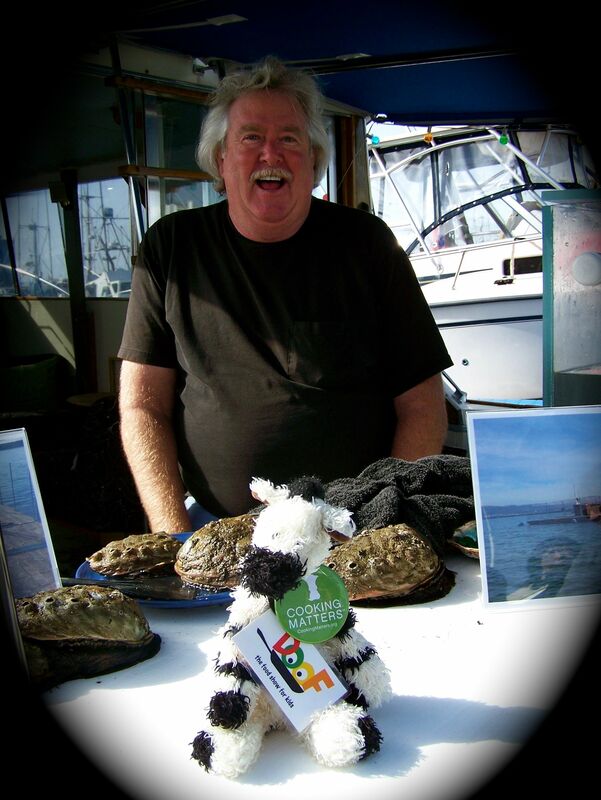 If you find yourself near Half Moon Bay, just stop by Doug’s boat at slip F-22 in Pillar Point Harbor – he’s there most weekends from 11 am-4 pm (depending on the weather and his mood). 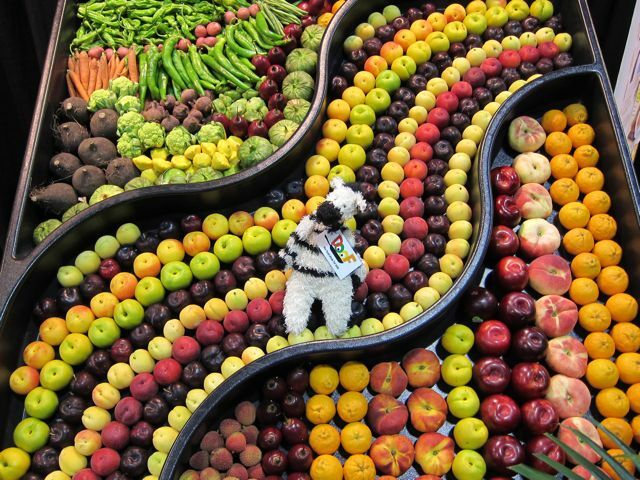 If you see him, be sure to say hi from ZeBot! 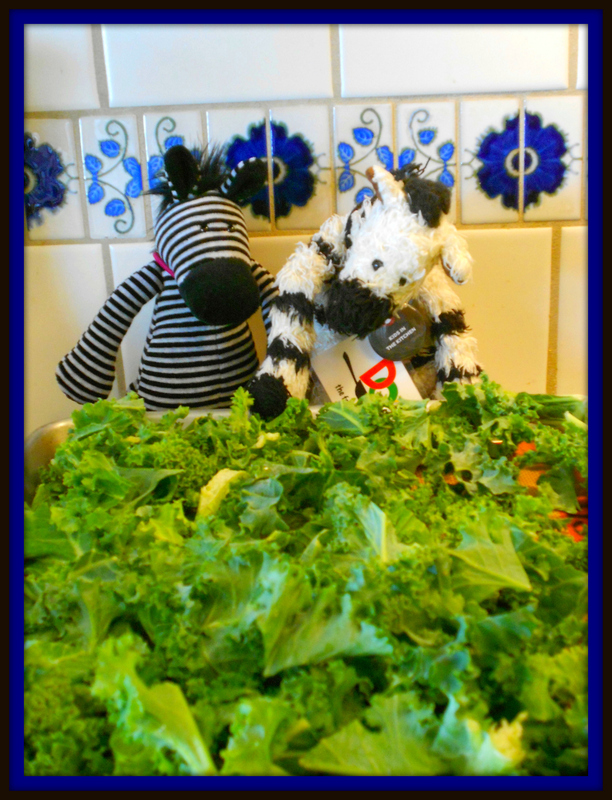 Stay tuned for more exciting zebra culinary adventures! 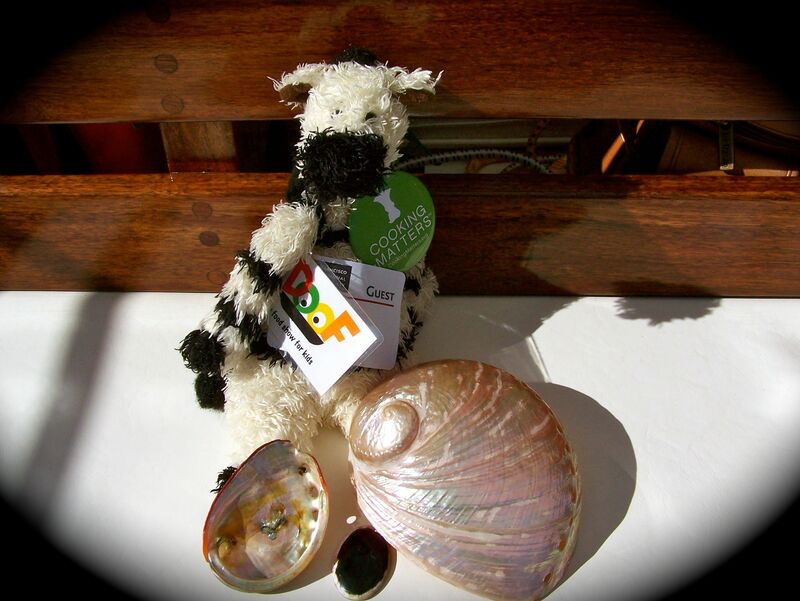 Posted on March 23, 2013 by ZeBot Zebra	• This entry was posted in ZeAdventures and tagged abalone, adventure, aquafarming, kids' cooking, ocean, Pillar Point Harbor, San Francisco Bay Area, seafood, sustainable, ZeBot, zebras. Bookmark the permalink.